A civil engineer offers his take on Mayor de Blasio's $2.7-billion boondoggle. The following is written by a civil engineer who works on bus signaling and requested anonymity because the engineer often works with public agencies. 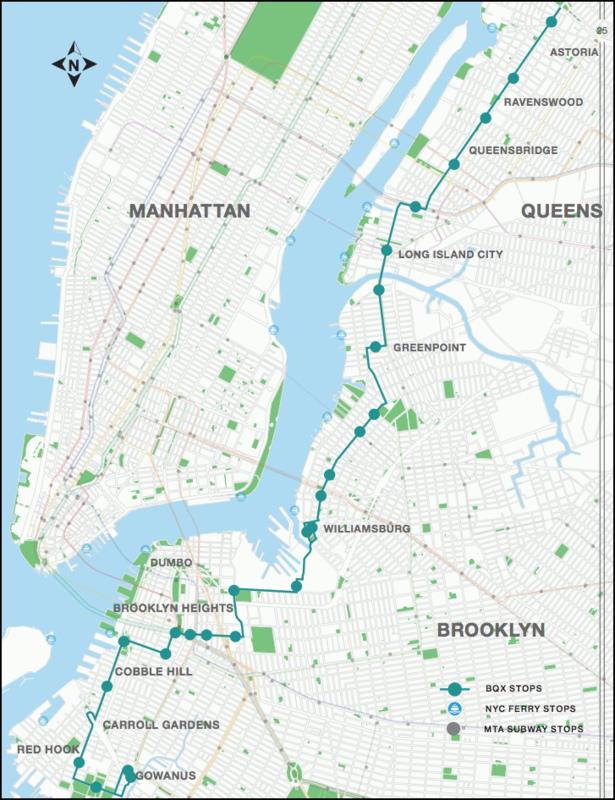 Mayor de Blasio’s proposed Brooklyn Queens Connector is lauded as a gamechanger that’ll spur development, generate $30 billion in economic impact, and reduce travel time along an 11-mile route linking growing communities of Gowanus and Astoria. Transit oriented development will prevail! All of this sounds amazing doesn’t it? However the cost of the BQX is estimated to be $2.7 billion. Reminder: $2.7 billion is enormous. Surely there is a comparable alternative. After reading reports by the Mayor’s Office and city Economic Development Corporation [PDF], I am not convinced that the BQX is the best use of our city funds. A Bus Rapid Transit route should cost less and achieve all of the benefits of the BQX. It can work with existing bus routes, spur development, and reduce travel times if correctly implemented. Let’s examine. The cost of the BQX is estimated at $2.7 billion. The source of funding for the $2.7 billion is not yet known, but what is known is that acquiring this amount of funding would take years. Instead, the city and state could choose to fund the MTA and improve our overall transit system. One item included in the cost of the BQX is a $241-million bridge over the Newtown Creek that would connect Manhattan Avenue to Vernon Boulevard. This seems absurdly high, given that the cost of buying new Select Bus Service buses and operating this route would pale in comparison to this bridge. For example, the operating costs for New York City Transit are $30.40 per mile and $215 per hour. If a new SBS route were to follow the same route as the BQX, it would cost $1.9 million per year to operate. This new SBS route can use many existing stops as it follows three different bus routes which would reduce the cost of building a new route. The proposed route is 11 miles between Gowanus and Astoria. There are 27 stops along this route with the plurality in Downtown Brooklyn and Williamsburg. The proposed BQX route is currently serviced by three bus lines: The B57 (from Gowanus to Downtown Brooklyn), the B62 (from Downtown Brooklyn to Long Island City), and the Q100 (from Long Island City to Rikers). The B57 and B62 run parallel to the proposed BQX while the Q100 overlaps with the final four stops of the BQX. In addition, a BRT can also offer a route that combines parts of all three of the aforementioned bus lines, with no need for eminent domain since the BRT would run on city streets. The bus stops can be reused and most of the right of way is already established. There would be no need to develop the 27 different stations of the BQX. This reduces the cost of the BRT since most of the infrastructure is already there. The report by EDC also states that 70 percent of the lanes used for the BQX would be exclusive for the streetcar — but that only means that such a dedicated right of way could also be done for the BRT. Currently SBS lanes are often obstructed or slowed down by deliveries and other vehicles. That is why the lanes must be cordoned off with physical infrastructure. Once this is done, the BRT could be equally successful as other BRTs such as the TransMilenio in Bogota, Colombia. Supporters of the BQX claims that the streetcar would serve 50,000 riders a day and that SBS or BRT cannot compare — but this is false. Currently the B46 services 44,000 riders a day along a 6.5 mile route on Utica Avenue. The light rail is larger and has more capacity, but adding another bus along the route should alleviate this concern and manage passenger wait time. MTA buses also have the added advantage of signal priority. The technology has been proven effective and has improved travel time throughout the different routes. The BQX would be solely owned and operated by the city, as opposed to the BRT route that would be owned by the MTA. This would bypass any need for external funding from the state and approval from Governor Cuomo, which has been the main problem of the MTA. Urban rail has a higher perceived economic benefit than a BRT system because rails and cars feel permanent and bus routes can be easily cancelled or rerouted. In reality, of course, this almost never happens. A true BRT route would attract potential employers and help businesses — especially if New York City Transit President Andy Byford continues to emphasize buses. A truly dedicated Bus Rapid Transit with dedicated bus-only lanes would be a cheaper and more efficient alternative to the BQX. The BRT system could be built for even less than the cost of the proposed Newtown Creek bridge itself. Many of the benefits of the BQX can be achieved with a BRT such as increasing accessibility to job clusters in Downtown Brooklyn and Long Island City, supporting transit oriented development, and connecting existing and growing communities. The BQX as well has no official city agency that will oversee and operate the system. Who is to say the city won’t delegate the responsibility to the MTA? There are issues with the MTA and they are not the best candidate to oversee this BRT but under new leadership it can and should be done. Given that the cost calculations that he/she used was based on current city SBS implementation, that would just be wildly optimistic if you were to implement BRT correct that would actually function as designed. The assertion of the article: “””given that the cost of buying new Select Bus Service buses and operating this route would pale in comparison to this bridge.””” is simply fantasy. Let’s not forget that BRT stands for BUS. If people, the masses, looked at buses as a viable option, then there would be no need for rail. Buses, as a transportation option, cater to low/medium ridership applications. We’re talking about building on the next generation of mass transit in the nation’s largest city. How the hell are buses even part of this conversation? “Isn’t accessible for poor and working class people? Last time I checked, this line is slated to make stops within steps of thousands of public housing units in Brooklyn. And no, those public housing complexes will not be easily gentrified. So that tosses that part of the argument out the window! To this day I would never understand why the els were ripped out decades ago. It’s been proven that they work just fine and people can live amongst them (e. g. Upper Manhattan, Brooklyn, Queens, Chicago, Philly, Baltimore, LA, Miami, Atlanta to name quite a few). I personally think that people would much rather prefer climbing 15 feet as opposed to descending 100 ft underground for Rapid transport. The benefits are apparent. Grade-separated rail, unimpeded traffic flow, greater Regional mobility, and lower startup and maintenance costs. It’s a no-brainer. Yeah- I’m sure this streetcar will be full of a diverse and broad selection of New Yorkers (who both live and work along the waterfront, or have the money for an additional transportation mode that isn’t integrated into the MTA). Go take a ferry ride, an equally unintegrated and waterfront focused vanity transportation project and tell me how diverse it is. Poor people in this city take the bus, and suffer through the slowest average bus speeds in the country. These billions of dollars would be much better spent on the many aspects of bus transport the city has control over, namely, bus priority signalling and fully building out a bus lane network. This is, once again, a vanity transportation project whose main utility is to real estate developers and wealthy waterfront dwellers. It’s an absurd giveaway to de Blasio’s real estate donors that will spend billions of taxpayer dollars that could be much better spent addressing more pressing transportation needs in the city. I concur. In theory, this is an okay LRT route. Really. Good even. Not the best choice, but good. However, it costs something like quadruple what it should. A better choice would be to replace one of the busiest non-Manhattan bus routes with LRT. But you can’t really have it both ways. Either improving surface transit this much is good, in which case surface makes sense, or it’s bad and the money should be spent elsewhere. There’s no cogent argument for “Surface rail is bad here, but use a bus instead.” Not here anyway. The main alternative is do nothing. Which really might be the best choice. I think the constituent opposition to elevated train lines in NYC at least is overblown. People want improved mobility. As long as they can get places fast and cheap, they don’t care if it’s underground, above ground or whatever. It’s those small minorities who usually have a small/poor case for opposition. If we could build an elevated line rail line along the same corridor (or close by), it would be totally grade separated and wouldn’t get stuck at intersections. It could be fully automated, fast, run 24 hours a day and have rapid transit like headways. The MTA should be extending lines like the N, 1, 6, 7, etc, on elevated track too. The ones I mentioned are already elevated, might as well just extend them. And modern elevated rail could be quieter, concrete, sealed platform stations, and even glass/plastic covered tracks. Good writeup on more modern elevated rail in NYC. And for other examples check out Dubai and Chinese cities.